It's finally my turn to choose this week's Tuesdays with Dorie recipe and I was shocked how hard it was to decide! First, I felt I could not choose a chocolate recipe for the sake of my husband, which narrowed down the field. Then, I wanted something wonderful and worthy of the holidays. When I flipped the page to the Tall and Creamy Cheesecake I knew I'd found my selection. 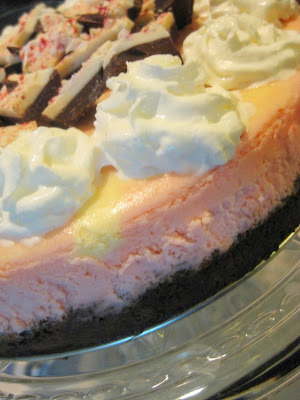 Dorie posted about this cheesecake back in April and I've been pining over it ever since. 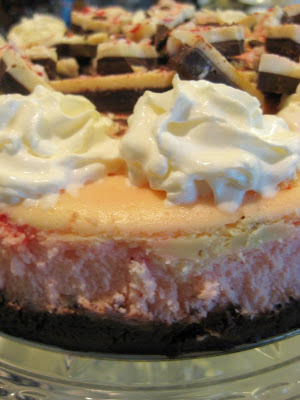 Highly customizable, this cheesecake is flavorful, beautiful, and not too heavy. 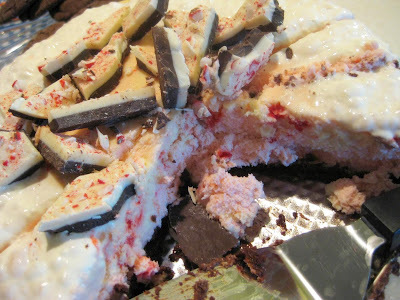 I'm dying to see everyone's variations and will post my own (Peppermint Bark) below Dorie's recipe. Inspired by a recent visit to The Cheesecake Factory, I divided the batter into thirds and flavored one-third with white chocolate and the other two-thirds with peppermint extract. I swirled in Andes Mint peppermint chips after marbling the two batters together. I also added a few tablespoons of cocoa powder to the crust for color (haha). I figured my husband could eat around that! We moved into our house on Christmas Eve (like crazy people) and are without internet. More importantly, we are without kitchen! The cabinets missed the train by one day and with the holidays that meant an extra two weeks. My husband was too anxious to finally live in his Christmas present, the biggest of his life, so we are sans internet, sans kitchen, and even sans kitchen sink! Thankfully our parents are close by so I'll be stealing computer and oven time around there until we are all set up. Have a happy new year and I'll be back with York Peppermint Patty Chocolate cookies (you can see them peaking in from one of the corners of the demolished cheesecake picture). I've taken the recipe from Serious Eats where you can hear more about it. Stir the crumbs, sugar and salt together in a medium bowl. 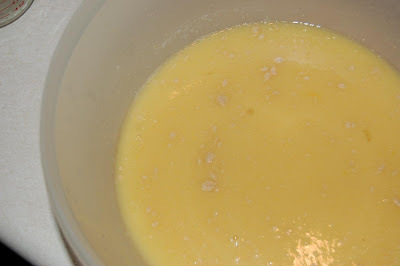 Pour over the melted butter and stir until all of the dry ingredients are uniformly moist. (I do this with my fingers.) Turn the ingredients into the buttered springform pan and use your fingers to pat an even layer of crumbs along the bottom of the pan and about halfway up the sides. Don't worry if the sides are not perfectly even or if the crumbs reach above or below the midway mark on the sides—this doesn't have to be a precision job. Put the pan in the freezer while you preheat the oven. Put the foil-wrapped springform pan in the roaster pan. 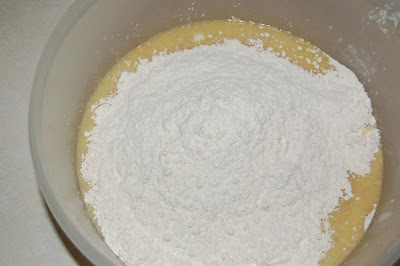 Give the batter a few stirs with a rubber spatula, just to make sure that nothing has been left unmixed at the bottom of the bowl, and scrape the batter into the springform pan. The batter will reach the brim of the pan. 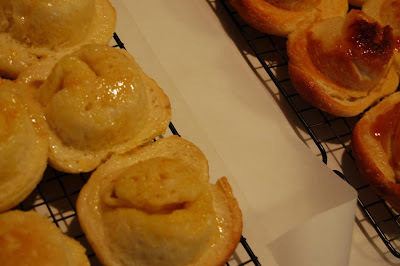 (If you have a pan with lower sides and have leftover batter, you can bake the batter in a buttered ramekin or small soufflé mold.) Put the roasting pan in the oven and pour enough boiling water into the roaster to come halfway up the sides of the springform pan. Bake the cheesecake for 1 hour and 30 minutes, at which point the top will be browned (and perhaps cracked) and may have risen just a little above the rim of the pan. Turn off the oven's heat and prop the oven door open with a wooden spoon. Allow the cheesecake to luxuriate in its water bath for another hour. When the cake is cool, cover the top lightly and chill the cake for at least 4 hours, although overnight would be better. Remove the sides of the springform pan— I use a hairdryer to do this (use the dryer to warm the sides of the pan and ever so slightly melt the edges of the cake)—and set the cake, still on the pan's base, on a serving platter. The easiest way to cut cheesecake is to use a long, thin knife that has been run under hot water and lightly wiped. Keep warming the knife as you cut slices of the cake. Wrapped well, the cake will keep for up to 1 week in the refrigerator or for up to 2 months in the freezer. It's best to defrost the still-wrapped cheesecake overnight in the refrigerator. Prepare crust as directed and stir in cocoa powder. Bake as directed. 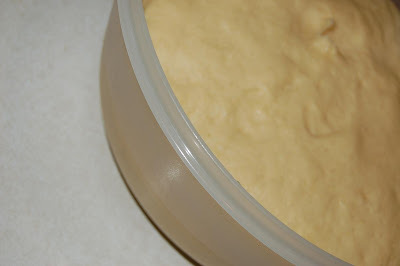 Prepare cheesecake batter as above and divide into thirds. Into one third, stir in white chocolate. Set aside. 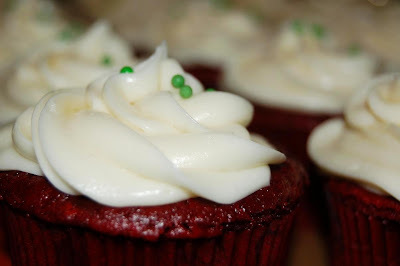 In other two thirds, stir in peppermint extract (to taste) and add food coloring to achieve desired color. 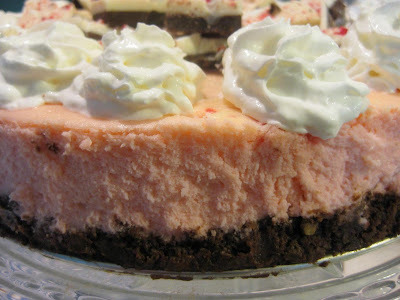 Pour in pink batter, spoon over white batter, sprinkle with peppermint chips, and swirl together to form a marble pattern. 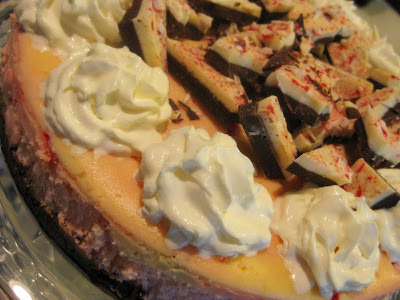 Bake and cool as directed and top with whipped cream, chocolate syrup, and peppermint bark. Enjoy! Merry Christmas everyone! I've been neglecting my blog and will spare you any excuses. However, I have been baking a lot (big surprise) for the holidays. We like to decorate sugar cookies with our families every Christmas and had a nice time together last night. I made Dorie's sugar cookies again but this time I added more vanilla, rolled them a little thicker, and baked them a little less. My husband said he liked the crunchier ones, and I much preferred this batch. Funny how we are all different. Either way, these were easy and delicious. The dough is irresistable, too. That's my definition of a good cookie, even if rolling the dough and cutting the shapes is less than fun for me. I do love the end results, though. Every year we have some fun cookies. Last year we had some weird fall themed snowmen after I got out some fall sprinkles on accident (never again!) My mom made these cute little guys. I love that they have collared shirts, haha. 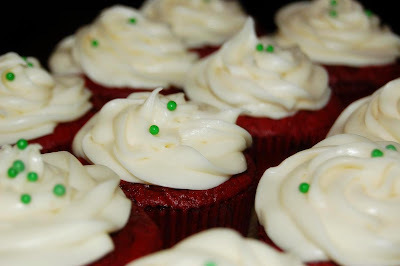 I'm making 100 red velvet cupcakes for the family Christmas party tomorrow (my mom has a really big family...) and can't wait to decorate them with my enormous new frosting tips (I even sprang for the 16 inch bag, wow!) 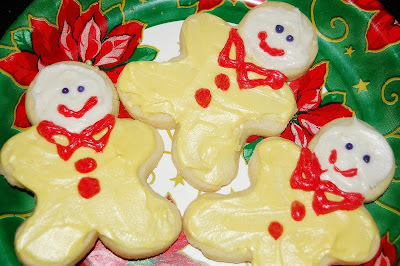 Kristi and I are going to try to decorate them together tomorrow while the kiddies play. Wish us luck! Cream butter and sugar until light and fluffy. Add eggs and vanilla and beat for a minute. Reduce speed to low and add flour slowly, being careful not to over-beat. 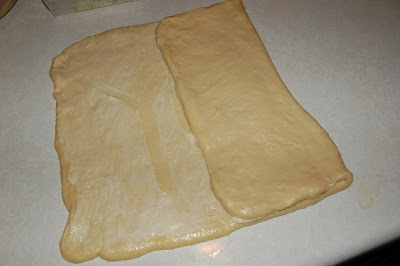 Divide the dough into half and shape into two disks. Wrap in plastic and refrigerate at least two hours. Preheat the over to 350. Line two baking sheets with silicone mats or parchment. 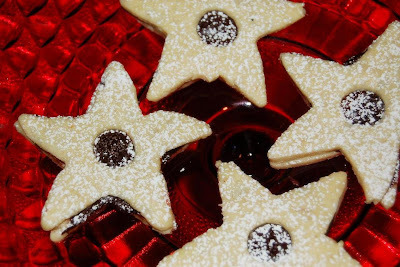 Roll out dough onto lightly floured surface to about 3/8 or 1/2 inch thickness and cut cookies out with cutters. Bake for 8 minutes for soft cookies, 10 for crisp. Remove from oven, place onto cooling racks, and frost after cooled. My mom is always a little more generous with the butter than I am. She made the frosting this year and it was delicious as usual. Beat butter in mixer until soft. Add about 1 cup of powdered sugar at a time until encorporated. Add vanilla and milk until desired consistency is reached. 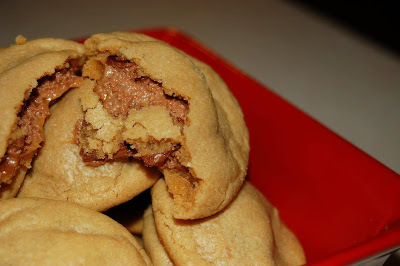 Peanut Butter Candy Bar Cookies and three winners! Look at those innocent little cookies, hiding a sweet and salty treat. It all started when my husband reminded me that he had volunteered to bring a treat to work today. Sure, I said. After all, I bake a lot (ahem) and I didn't think it would be a big deal. Well, Tuesday was a crazy day and we ended up with Suns tickets from my dad, last minute. Before we could go, I had to borrow my uncles enormous truck and trailer, drive my kitchen table and chairs from my in laws basement where they've been waiting for us to finally get our house, so the electrician can place the chandelier, unload (thanks to my brother for the help), and try and fail to move the piano we got on Craigslist. We made it to the game in the middle of the first quarter which I considered quite a success. We had sweet seats and I'm so glad we got to go- especially since I just heard that Raja and Diaw were both traded away! Diaw is my best friend Kara's favorite eye candy (he's French, after all) and Raja used to be a model before he joined the NBA. That's all I'll say about that, since my dutiful husband reads my blog. My dad has actually met Raja a few times at work (Raja drives a BMW) and he says he's also quite nice. Congratulations to Chocolate Chic, Megan from My Baking Adventures, and Allergy Mom who had the luck of the random number generator! Email me your address and we'll get your prize right out. Thanks everyone for the entries. I had an awesome time reading the great comments and hope it do it again soon. Now seriously... you probably have some left over candy bars in the pantry from Halloween. Go make these cookies! Preheat oven to 375. 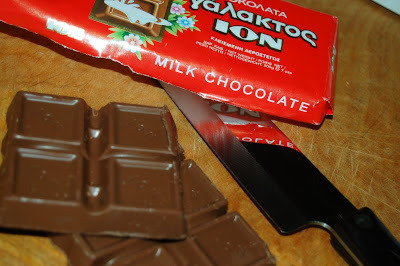 Cut candy bars into 1 inch pieces and set aside. Cream butter and sugar. Add eggs and vanilla and beat until well combined. Mix in peanut butter. Slowly add dry ingredients and mix until just combined. Scoop dough out, flatten slightly in your palm. 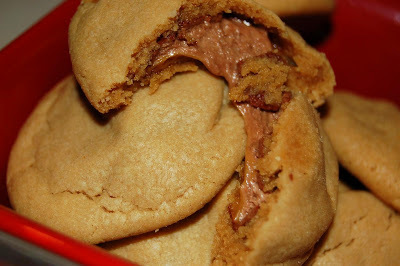 Place one piece of candy into the middle and roll in your hand to wrap the chocolate into the middle of the dough. Please on baking sheet, spacing apart generously, and bake from 9-12 minutes until dough has set but before cookies take on too much color. Remove from sheet and allow to cool. Enjoy warm! Sugar cookies! Nothing says Christmas more than these, especially to my husband. His family used to make these every year for Christmas and at some point (I'm presuming during their teenage years) they decided it just wasn't worth it. I've tried my best to reincarnate this holiday tradition and every Christmas since we got married, even when we were stuck in Utah two years ago since I was too pregnant to travel home, we've made them. 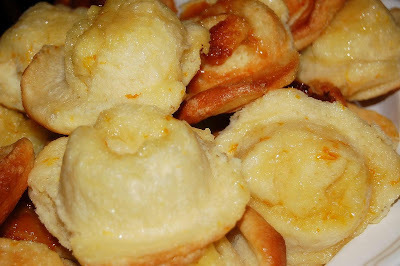 Even better, this recipe is easy to make, has DELICIOUS dough, and rolls out like a dream. I made a double batch and put 50 straight into the freezer to take to scouts on Thursday. I'm sure the boys will end up with some interesting designs- it should be a lot of fun for everyone! Thanks to Ulrike for this fun choice. Find the recipe there and whip some up tonight. With a quick dough, good freezability, and perfect rolling texture, I think these are just right. 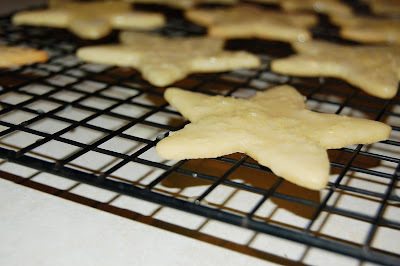 Next time I'll roll them a little thicker since I prefer a chewy sugar cookie (well, I prefer all my cookies to be chewier) but these crisp, easy to ice cookies are perfect. 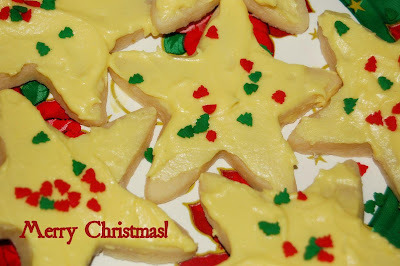 Don't miss all the other beautiful sugar cookies from the talented Tuesdays with Dorie bakers. Combine all ingredients and stir until smooth. Dip cookies to ice and allow frosting to harden. Part of the perks of living near family (two big families- our parents come from families of 7 kids) is getting together a lot. Part of the problem is getting together a lot! Really though, we love it here... and we'd better, since we just bought and house and my husband isn't looking forward to taking the bar exam anywhere else! So... we're abundantly blessed but really busy this time of year. Unfortunately, my blogs have been very neglected. I also haven't checked my regular reads and I've really just been in survival mode. I know you all think we have three course Barefoot Contessa meals for dinner every night followed by some exotic dessert (cough cough) but I'll admit we've eaten a lot of soups, salads, and sandwiches... not to mention leftovers and crockpot dishes! We are also working on remodel for our house and I can't wait to have a kitchen of my own again, soon. This is our old kitchen in Utah. My husband really wanted to try a new color so I flipped through the colors in the paint store and tried to keep an open mind. I don't think I was that successful, since it went about like this. Red (no, all my accessories are red). Orange (nope, never have liked it). Yellow (maybe... maybe.) Green (I'd love green!). Blue (could be too Americana with all the red). Purple (never have been much for purple for myself). Pink (I'd love a soft soft baby pink, my husband would die). Brown (the rest of the house is tan, I'd like some color). And there you go. It left yellow (his choice) and green (my choice). I was prepared for yellow but last minute I told my husband, "I just can't do it! It's not me! 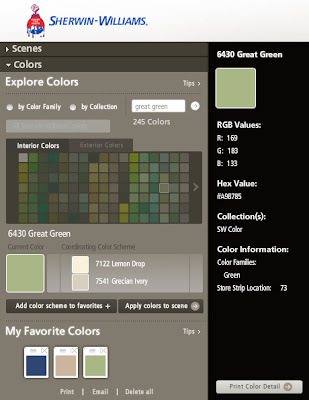 I want green for the room I'm always working in!" He caved and said as long as it was something different Green was fine. So I went back to the paint store and chose a random green, bought a trial, and slapped it on the walls. He came over and said, "Looks just like the old green. But if it makes you happy..." So there you have it... this color green seems to be my soul mate. In my defense, it is a little less grey and a little more "apple". Either way, it's going to be pretty. We spent last weekend ripping out flooring, painting, and begging our relatives to babysit. We hope to move this weekend and have the kitchen operating in about two weeks. The blue is the color for the master bath (approximately) and the rest of the house will be the tan, with white doors and trim. The flooring is coming in this week and I'll have pictures soon. And finally... don't forget that today is the last chance to enter the giveaway! 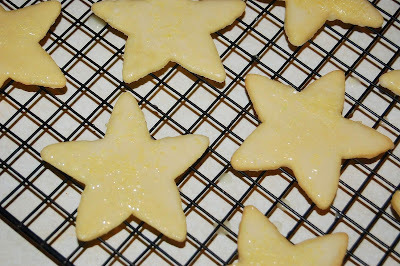 Tomorrow I'll be back with Dorie's ridiculously delicious sugar cookies. Thanksgiving has come and gone and Christmas music is all over the radio! I finally feel ready for the holidays and this month's Pies With That theme- Holiday Songs. I had a ton of fun picking a theme but in all the mayhem I nearly missed making my own pie! It came to me, though, while I was driving one day- those chocolate bells could totally make a "Jingle Bell Rock" pie. 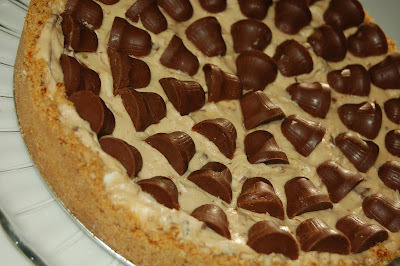 From there, I decided on Reese's chocolate bells and a rendition of my Aunt's wonderful peanut butter pie. For the rocky road portion, I mixed in toasted walnuts, marshmallows, and chopped chocolate (I opened my last bar of Greek chocolate I smuggled in my suitcase!). 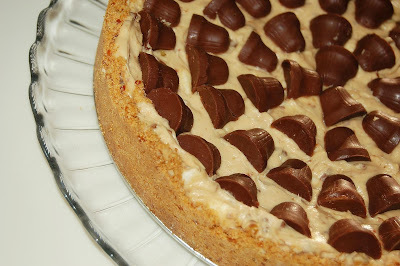 I also had to fight every urge to drizzle the whole thing with caramel or chocolate. It would have been beautiful but there was already PLENTY going on here without adding any more sugar! That piece was cut out for the photo and stolen instantly! So much for a solo shot! I intended to make a regular graham cracker crust but happened to run out of grahams before I got enough, so I threw some pretzels into the food processor to make up the difference. The crust ended up pleasantly salty and complimented the rest of the pie. I did make it in the spring form pan to hold more pie since I had a big crew eating it. Thankfully, this is one rich pie- so one 9 inch spring form covered about 16 people (plus toddlers- we don't usually count them for food but with desserts, they are starting to eat their share!). The end result reminded me a bit of Dorie's Peanut Butter Torte, but I liked it a bit more without the chocolate crust. But honestly... with peanut butter, chocolate, and more, "how bad can that be?!" Don't forget to enter the giveaway here if you haven't yet! Combine all ingredients with a fork and press into butter, 9 inch spring form pan. Bake for 10 minutes and set aside to cool. In the bowl of a stand mixer fitted with the paddle attachment (or a hand mixer), combine cream cheese, powdered sugar, milk, and vanilla. Beat until smooth. Gently fold in chocolate, walnuts, and marshmallows. Dump into cooled pie crust and smooth. 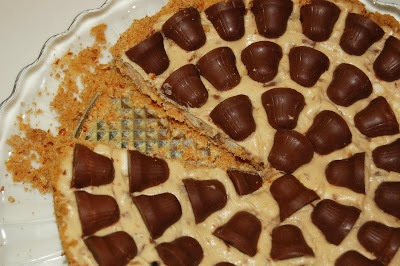 Using a thin serrated nice, slice the Reese's bells in half and position in a pattern on top of the pie. Cookies again-yes! This week's Tuesdays with Dorie selection comes from Noskos. I've never made or heard of these cookies so I was happy to try something new. 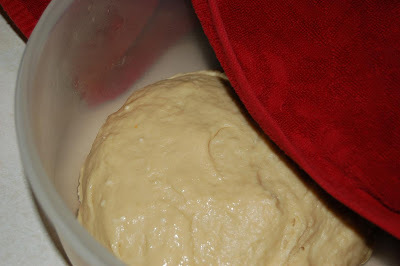 The dough came together easily and offered lots of varieties with the nuts, filling, and spices. I decided to use macadamia nuts and chocolate ganache, like those candies people bring back from Hawaii... I've always liked those. I used only the tiniest bit of cloves and cinnamon to spice the dough since I wasn't sure about the flavors altogether. I also rolled the dough a little thinner than recommended (and was sure to under bake them slightly) so they ended up quite delicate. 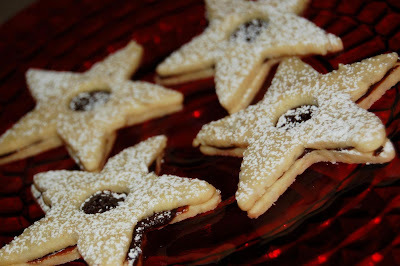 I also sandwiched a few cookies with raspberry jam for my non-chocolate eating husband. I wasn't sure which flavor I would be prefer but in the end I liked the cookies that had both jam and ganache (particularly since my ganache was so dark and didn't seem quite sweet enough). I still have a little dough left in the fridge and I'm excited to experiment with it and see what I can come up with. 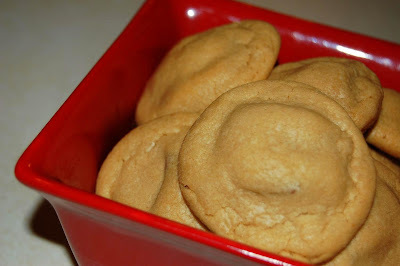 Don't forget to snag the recipe here and try some of your own delicious little cookies. Now (to catch up for last week's TWD...) here is my thanksgiving two-fer pie. 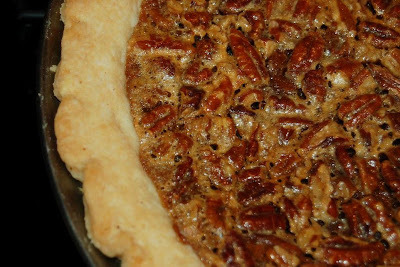 I've never actually made Pecan or Pumpkin pie so it was fun to try them together. This was one pretty pie! I followed the advice concerning the crust and did not blind bake it. I also saved some of the pumpkin filling to make into a mini pie and was glad I did- it was plenty full! 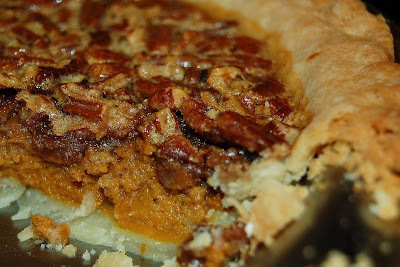 I'm still not a huge pumpkin fan but this was yummy- even if my edges almost burned and the bottom of the pastry wasn't quite cooked (the soggy part was delicious to me, don't tell!) I think this is a recipe that needs some perfecting for me to get it just right but is totally worth the wait. You can find the recipe on Vibi's blog. Now for the giveaway... three lucky readers (randomly selected of course) will receive a Pillsbury gift basket. 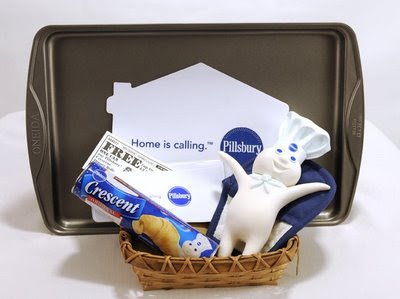 The basket includes a coupon for Pillsbury refrigerated crescent rolls, a magnetic coupon holder, a house-shaped mouse pad, pot holders, a cookie sheet (you can never have enough of those), a bread basket and a Pillsbury Doughboy figurine (haha!). Pillsbury is also donating to American foodbanks for each person that checks out their website here. 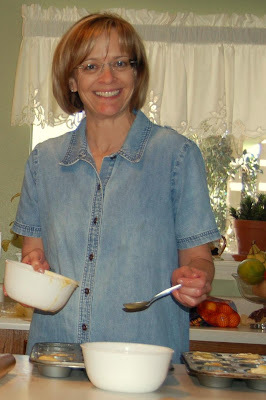 In order to enter the contest, just leave a comment here and let me know what your favorite part of family meals is. My favorite part has to be making them with my family and sitting around and talking afterward. In my pre-mommy life I studied families and know how important it is to spend time sharing meals together. The holiday season is the perfect time to spend together in the kitchen and I'm looking forward to it! (Contest will end next Monday night, at midnight, AZ time). Don't forget to stop by later this week to see my entry for December's holiday music themed "You Want Pies With That? "- it's more than over the top and delicious too! 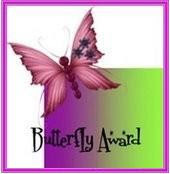 I'd also like to thank Peggy for this nice award and her kind words. I so appreciate the wonderful blogging community and love this new hobby. Thanks Peggy! Heat 3 tablespoons of olive oil in a large pot or Dutch oven. Add the onions, celery, and carrots and cook over medium-low heat for 10 minutes, or until the onions start to brown. Add the garlic and cook for 30 seconds. Add the chicken stock, tomatoes with their juice, jalapenos, green chiles, hot sauce, cumin, and about 1 tablespoon salt (depending on the saltiness of the chicken stock) and 1 teaspoon pepper. Bring the soup to a boil, then lower the heat and simmer for 25 minutes. Add the shredded chicken and season to taste. Meanwhile, brush tortillas with oil and cut in 1/2, then cut them crosswise into 1/2-inch strips. Bake at 350 in a nice flat layer until crisp (about 10 minutes). 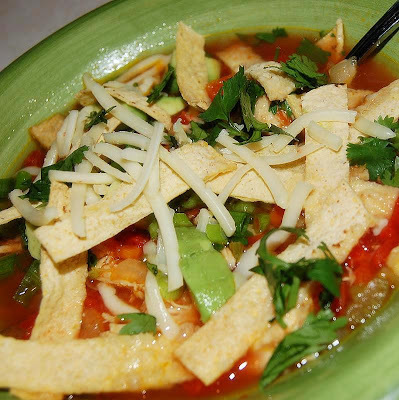 Serve the soup hot topped with frozen corn, sliced avocado, a dollop of sour cream, grated Cheddar cheese, and homemade tortilla strips or broken tortilla chips. I can't believe it, but Thanksgiving is already here. That's not as shocking as the realization that follows- Christmas is coming! 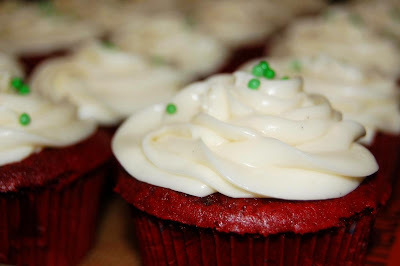 With the start of this wonderful season, I'm reminded of one of my favorite things to bake. This roll recipe comes from a family friend and neighbor who happens to be the best preschool teacher in the world. She's infinitely patient but you won't have to be to enjoy these rolls. Peggy, the best baker I know, sharing her secrets... don't tell her I told! 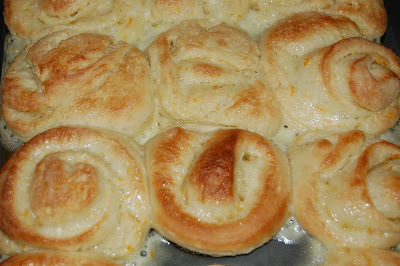 Even better, they are easily adapted to my other friend's world famous orange rolls. 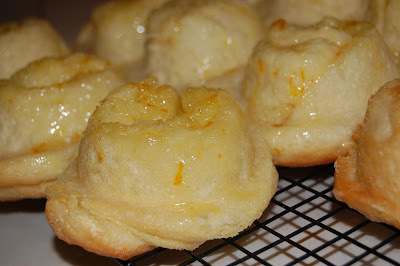 She did mention several times while she helped me make them that there are no calories in orange rolls. Enjoy and hop on the treadmill the next morning. Dissolve the yeast. Combine melted butter, sugar, and salt. 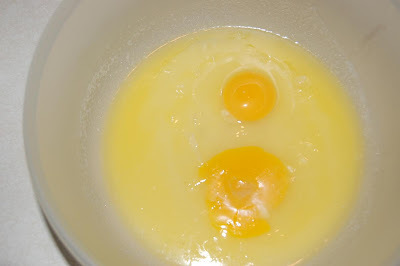 Add eggs and beat into mixture. Stir the yeast mixture into the bowl. Put the dough into a bowl with a little oil and cover with a dish towel (don't click on that photo, you'll see flour lumps... don't worry though, they disappear later). Let rise until doubled. It tastes good too, if you aren't too afraid of salmonella, which obviously isn't a worry at my place. Divide dough into thirds and roll out. Spread with softened butter (go easy if you'd like, or add cinnamon sugar, herbs, whatever strikes your fancy). Dissolve yeast into warm water (a little warmer than your body, but not too hot to kill the yeast). Sprinkle sugar on top of yeast and set aside. 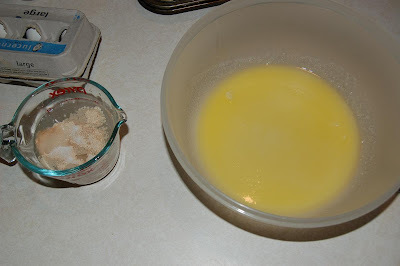 In a large mixing bowl, combine melted butter, sugar, eggs, and salt. Mix with a fork until combined. Sir in frothy and dissolved yeast mixture. 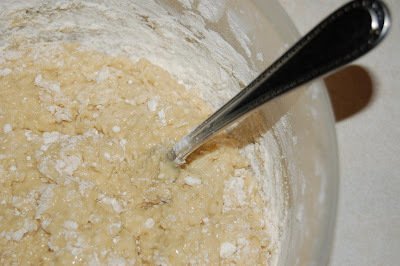 Add flour and mix together well with a fork for a bout one minute (it should be fairly smooth but don't worry about kneading it). Place in a greased bowl and cover with a dish towel. Let rise until doubled. Divide dough into thirds. Pour a little oil onto your hands, pin, and counter (don't use flour). Roll out one piece into a nice rectangle, about 1/4 inch thick. Fold into thirds and slice into pieces about 3/4 inch wide. 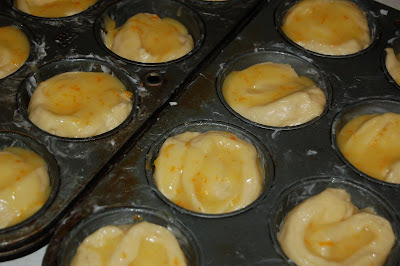 Tie each piece into a little knot, place on a greased or lined baking sheet, and let rise until doubled. Bake at 375 for 8- 10 minutes, until golden brown. Combine all ingredients in a small bowl and stir until a thick paste forms (if too runny, add more sugar). 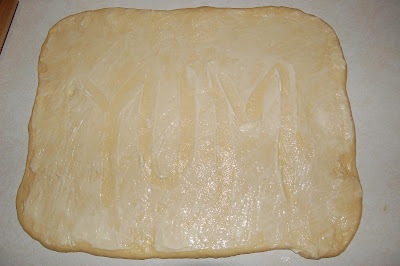 Roll dough into a large rectangle (about 12 x 18) and spread paste over the dough. Roll up (like cinnamon rolls) and slice dough about 3/4 inch thick. Place each piece into a very well greased muffin tin. Bake at 375 for 15-20 minutes. Begin checking the rolls around 12 minutes and watch closely, as they will brown quickly (note the difference of color in the two batches in this picture). 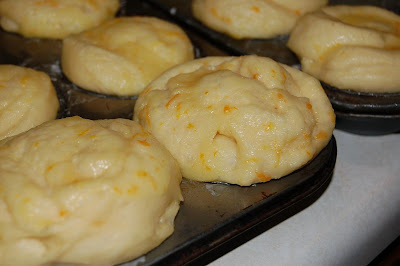 Remove the rolls from oven once they are browned and immediately flip onto a cooling rack place atop parchment paper. Let cool and serve inverted. The juice will drip down to make a nice glaze. Serve warm. I've been devoted to a KitchenAid spatula for exactly four years since I first took my cooking class in college. Each of the kitchens was stocked with two of these perfect scrapers-great for cleaning out the bowl of the KitchenAid, safe for nonstick pans, and awesome for omelets. I looked all over Utah Valley for one of my own and tried 5 or 6 stores. I'm not sure why I didn't just check Amazon but I eventually found them at Robinson's May (haha) and bought two for myself for Christmas. I've probably purchased 10 since then for gifts and for my drawer (one just wasn't enough- and at only five bucks at Marshall's I needed more). 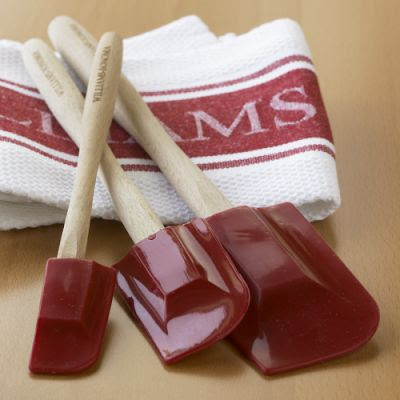 However, I just got the Williams Sonoma Catalog and suddenly I'm changing my tune. 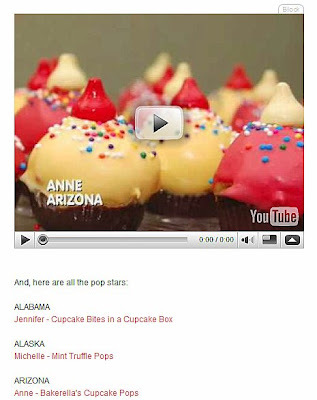 I'm fighting every urge to order the regular set of three and the minis personalized to say "AnneStrawberry." 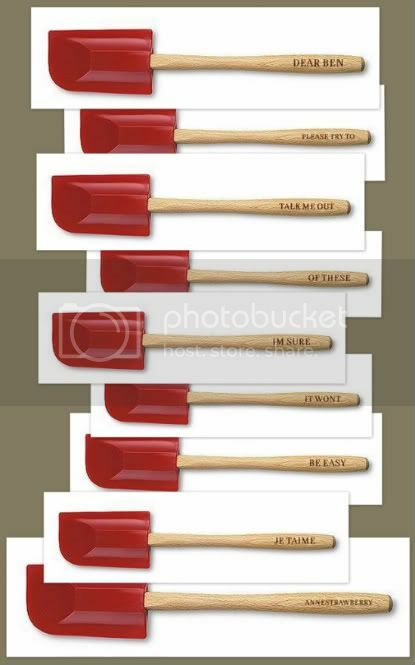 Seriously though, can you ever have too many spatulas?